Flammable gel is the basis for a simple gel candle. 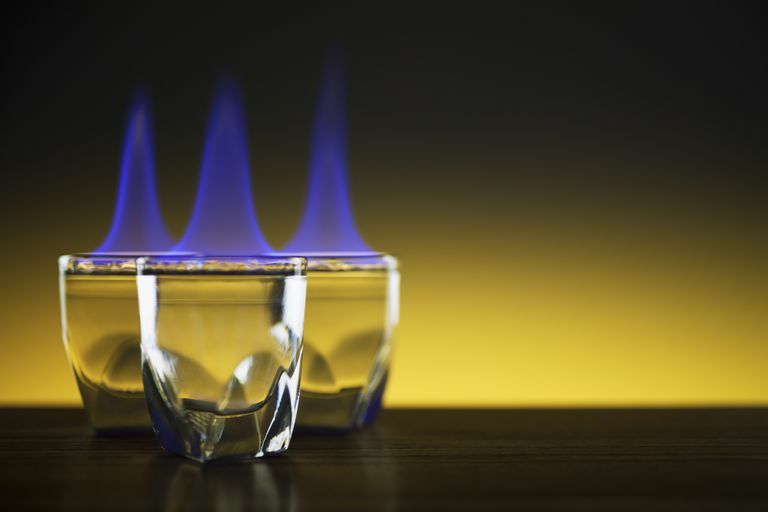 Use three common household ingredients to prepare a gel or jelly that you can set on fire. This is an easy fire chemistry project that you can do at home. 70% isopropyl alcohol will work, but you will need to allow let the mixture from step 3 evaporate until it is a little more concentrated to make up for the extra water in the alcohol. Crush 5 antacid tablets into a powder. Stir 50 ml (~10 tsp) of vinegar into the powder (10 ml per tablet) to make a slurry. Allow the slurry to evaporate until it is less than half its original volume. This could take about a day. If you accidentally evaporate all of the water, you can reconstitute the slurry by stirring in a small amount of water. Fill a container with about 2x the volume of however much antacid slurry you have at this point. While stirring, slowly add slurry to the alcohol to form a thickened gel. Do this slowly: If you add too much slurry, the mixture will liquefy and you won't get a gel. So, once you have a gel, don't add any more of the calcium tablet slurry mixture. Scoop up a ball of the gel and ignite it. Disclaimer: Please be advised that the content provided by our website is for EDUCATIONAL PURPOSES ONLY. Fireworks and the chemicals contained within them are dangerous and should always be handled with care and used with common sense. By using this website you acknowledge that ThoughtCo., its parent About.com (a/k/a Dotdash), and IAC/InterActive Corp. shall have no liability for any damages, injuries, or other legal matters caused by your use of fireworks or the knowledge or application of the information on this website. The providers of this content specifically do not condone using fireworks for disruptive, unsafe, illegal, or destructive purposes. You are responsible for following all applicable laws before using or applying the information provided on this website.